Your tongue arches in the front of your mouth to sing front vowels. Your tongue does most of the work shaping front vowel sounds, but make sure that both your lips and tongue are released and free of tension. The front vowels don’t require as much lip action as the back vowels. The front vowels are much less open than the back vowels. These vowels aren’t as wide open as the back vowels. It may sound odd, but it’s true. The vowels in the table below are called front vowels because the tongue arches in the front of the mouth to make these sounds. Keeping the tip of your tongue touching your bottom front teeth, say the vowel ee. Notice how your tongue arches in the front of your mouth when you make the sound. You also feel the sides of your tongue go up. Jaw drop slightly for the ee vowel and gradually move down more as you move from ee toward a.
Lips slightly open for the ee vowel, and open more as your jaw drops when you move to the most open vowel, a.
Tongue arching in the front, the highest on the ee vowel and the lowest on the a vowel, and the tip of the tongue resting against your bottom front teeth. 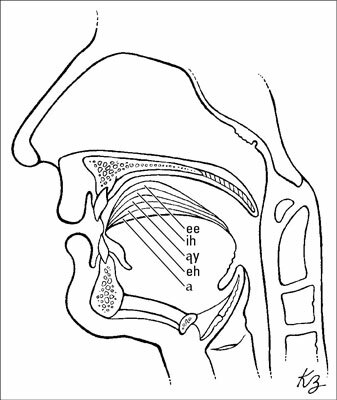 The following illustration shows the arch of the tongue for front vowels. Some words in the table have two vowels, but only consider the vowel sound in the first syllable. Now it’s time for you to put all the front vowels in sentences to practice speaking. Using these vowels gives you an opportunity to return to the correct arched position of your tongue after moving through the consonants. We meet lean, mean fiends. Leave me peas teased, Eve. Hip chicks knit big mitts. Cliff fixed its clipped wick. Tim’s busy with his chips. Dig Phillip’s little sister Lilly. They say Abe gained weight. Deb’s pet pecked every peg. Edge any hedge, says Ned. Kelly’s mellow fellow fell dead. Prance aghast past grassy path. You want to make precise vowel sounds as you sing. Singing a song requires you to move quickly from one vowel sound to the other; you must quickly change the arch of your tongue to accommodate the different vowel sounds. You have to make the shape happen at the speed of the music. If you practice singing the vowels alone, you give yourself the chance to really get them solid before you add consonants in words. You may not be able to tell the difference between each vowel sound as you’re singing the pattern in the illustration below. So record yourself singing and then listen to the recording. Pretend that you’ve never seen the pattern and try to distinguish which vowel you’re singing. Notice which vowels aren’t as precise as others, and you can make those a priority in your next practice session. If they aren’t clear, go back and practice making the shape, saying the words with the vowels, and then singing again. Work the vowel sequence in the following illustration to get that tongue arched quickly to get the right vowel sound. If your tongue doesn’t move fast enough, you may sing a different vowel. No problem — just keep trying. When you’re able to clearly distinguish each vowel sound, insert some words into the pattern for variety and spice in your practice routine.